The Chateau Collection III by Wessel-Werk Premium Attachment Kit is one of the finest central vacuum attachments on the market today. German engineered by Wessel-Werk a leading European manufacturer for central vacuum cleaning accessories. When you purchase this attachment kit, you will be purchasing not only the finest quality attachments, carpet head, bare floor brush, and hose, but this reputable central vacuum accessory kit comes with fantastic 5 year motor warranty and we here at Thinkvacuums.com offer free maintenance once a year of your power head. What makes this the best central vacuum attachment kit? This attachment kit is extremely user friendly with precision German engineering and quality; makes this a delight to use. Highly maneuverable vacuuming under furniture is made easy with its low profile and the wand's ability to lay flat thanks to a 90-degree pivot neck. Soft rubber wheels located on the back and front of the Chateau Collections Wessel-Werk power head allow for optimal performance on various carpet surfaces while also making the transition from carpet to hard flooring. Visibility is enhanced with the addition of a high intensity headlight and lens for optimal illumination.. Lab tests show it successfully recovers as much as 92.9% of debris compared to 85.5% from its closes competitor. 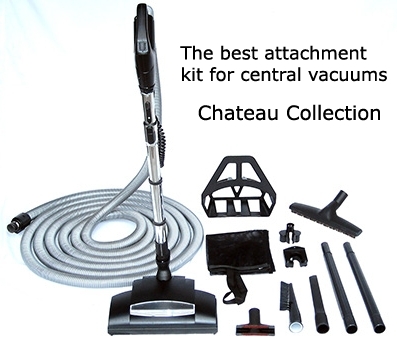 The features of the useful attachments included in the new central vacuum Chateau Collection kit will allow ease to every day cleaning. The central vacuum hose and handle designed by Plastiflex allows collaboration by two leading manufacturers in the industry. Providing a handle that permits you to grip at several points on the handle to match where and how you want to clean. A full 360 degree swivel eliminates wrist strain, stops kinking, and increases hose life. If you're looking for a spare hose to compliment a central vacuum attachment kit click here. If you're looking for the power head only to incorporate with your current attachments, click here. A resourceful universal brush with soft nylon bristles and versatile elongated dusting brush that will change the way you dust. A Natural soft bristle 14" wide brush is ideal for wood floors. Easy roll, non marking and gentle for your expensive floors. Good for wood, tile or marble. Super long crevice tool cleans hard-to-reach places. Clipped end provides continuous air flow. Upholstery tool cleans upholstery with ease with built-in lint brush. And to store you central vacuum accessory kit a heavy duty ultra-deluxe hose hanger. This kit is so durable and reliable it will last for years to come!